Off to meet my other son and his family up in Seaside. It was a good time to try out one of the best Thousand trails Parks in Oregon that I had been hearing about. Don’t get me wrong. I have truly enjoyed all of the Oregon TT parks. They are great! Seaside RV gets very high marks from everyone. It is a little odd in that it was built on both sides of 12th Ave. I checked in on one side then entered just to turn around to go over to the other side where the pool was. I was very happy to score a a nice flat site out in the open for my satellite dish and very close to the pool and clubhouse. Beware the 5 mile an hour speed limit and gargantuan speed bumps designed to tear up your vehicle and insides no matter how slow you go. The pool is a bit small compared to other parks but it is a perfectly warm temperature and the building is lovely. My favorite things were the hot tub, the showers in the pool area, and the free arcade basketball toss. Adult swim is from 9-10:30 pm and it sure gets busy. Most nights the large hot tub is near full and we did have it filled to standing room only one night with the water draining out over the sides. That was a great night! 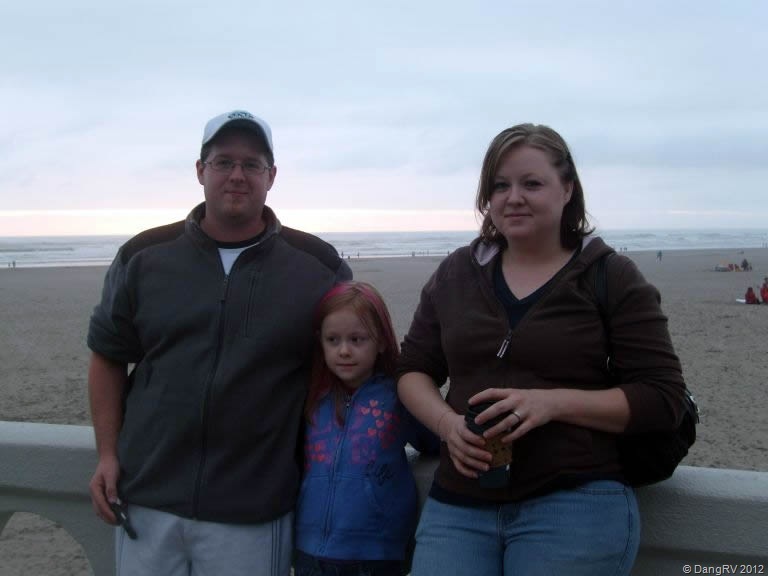 We had a couple of new full-time RVers there so everyone was telling their worst RV stories. LOL. It was very educational. The last night I was there, I went up for one last dip but darn it the building was locked with many adults milling around outside wondering why. We heard some kid had crapped in the pool that day so they closed it all for remediation. Dang kids! The ping pong table, basketball toss, and outside fire pit were pretty popular too. They had movie nights with popcorn, candy bar bingo, dinners, and their café serves breakfast for a fee on Saturdays. Wi-Fi was available in both clubhouses and the pool building. I was also able to ride my scooter a lot there. The only issue I had was with a new neighbor that moved in next to me. For 2 days I felt like I was living in a bottom apartment again with a constant boom boom boom of kids running around overhead. Trying to talk to the people after the 2 days did no good as their attitude was that it was a kid and nothing they could do about it so everyone else should just have to put up with it. The first reaction of management when told was that I should just move my trailer. Interesting. Someone in the hot tub had the same advice like moving my trailer was the only option I should consider. She was rather nasty about it in fact. First, I was in a prime select spot I wanted. Second, I was not the one causing the issue. Third, they have a rule in place about not annoying others or making them feel uncomfortable. Fourth, it takes a couple hours to move and I only had a few days left there. Lastly, I was not the only one upset by it. Every RV around them had complained. So, are we all supposed to move to non-prime spots and be quite inconvenienced while this rude family is allowed to just pull in at any time, anywhere and get away with violating the rules and and keeping others from coming back to the park? That makes no sense. When pushed, management finally went over to talk to them and moved them to another site. That made all of us happy but it really didn’t solve the issue and I’m sure made several other campers miserable too. My son came over and stayed at a local motel near the beach district on Broadway. We had a couple dinners together, rode the indoor carousel, salivated all over the kite shop, played air hockey at the arcade where Mom proved she can still whup him, and checked out the beach. 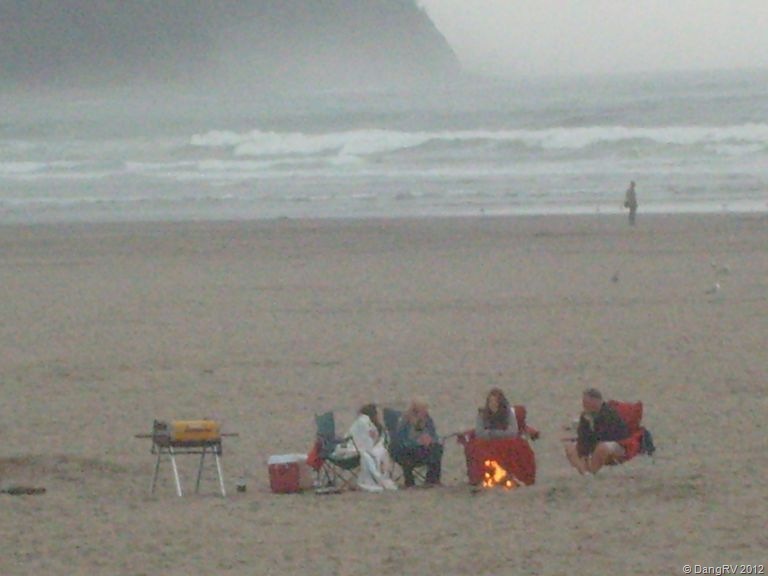 According to Facebook, they sneaked back later for a campfire and s’mores on the beach without me. Caught! I had fun harassing him about it the next day. Really people, watch what you post on Facebook and Twitter when you are sneaking around. Like duh. 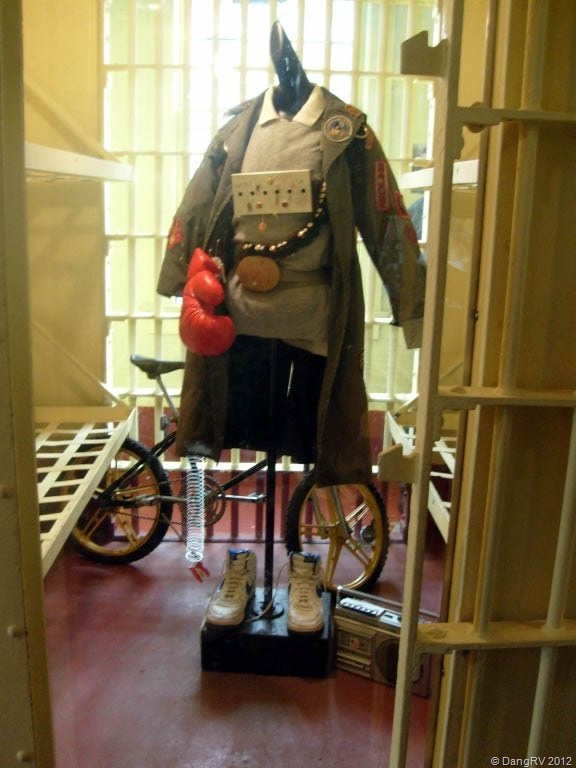 We went up to Astoria to see the Oregon Film Museum which is located in the old county jail. 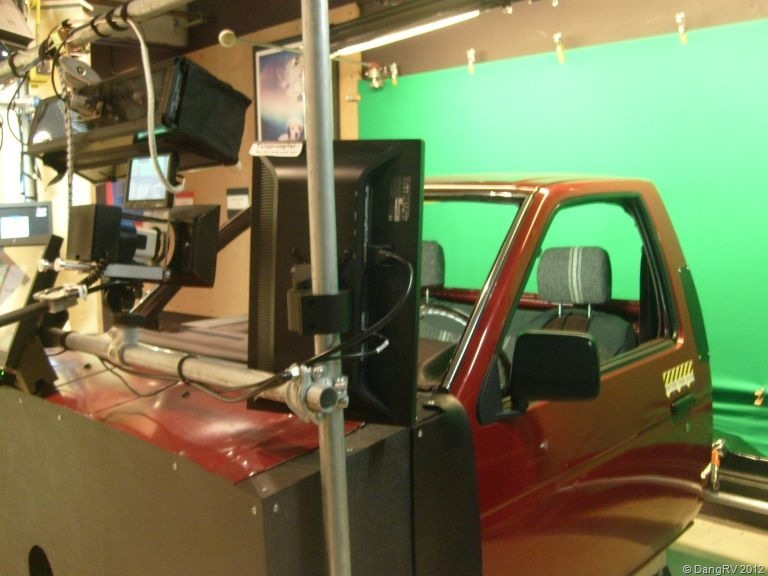 Not much there really and way too noisy and crowded in the small building to try to shoot a movie scene in the layout they provided with equipment. Mostly it was a monument to the movie “The Goonies” with some of the items from it. Across the street is the Flavel House, an old and gorgeous Victorian home one of the Astoria founders lived in. It is open for tours though we didn’t have the time that day. My son and his family toured the Astoria Maritime Museum another day while I was working and tell me that was well worth it. Before they left, we had a barbecue outside at my campsite. We got into a little bit of a squirt gun fight then I engaged my granddaughter in a pea fight during dinner. She doesn’t like eating peas so I thought she would like wearing them. She thought I would also enjoy that. Not sure who won. I think it was a draw. Still finding peas in my trailer and coat pockets! 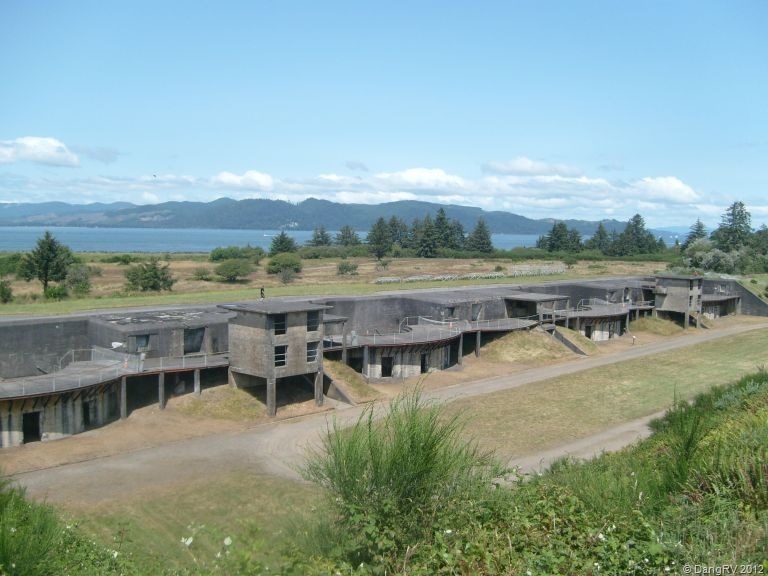 I got lucky and caught Fort Stevens on a special weekend. 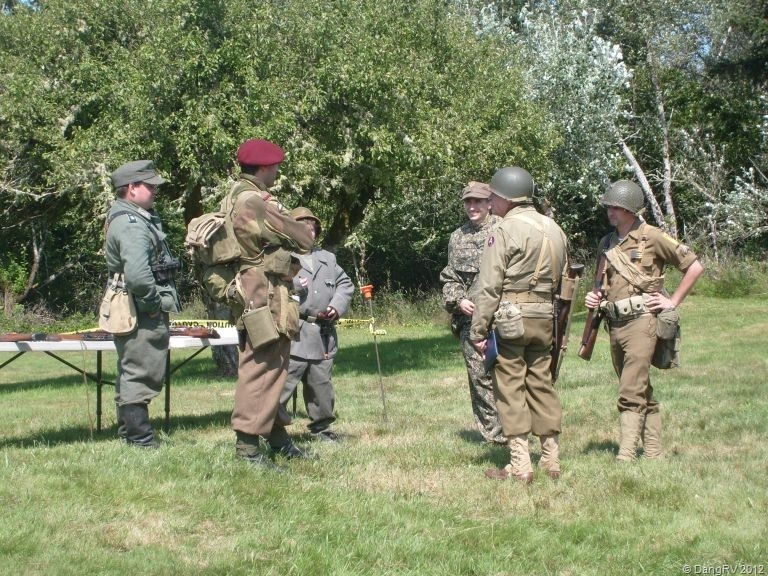 Lots of volunteers were dressed in uniforms from America, Germany, and France. 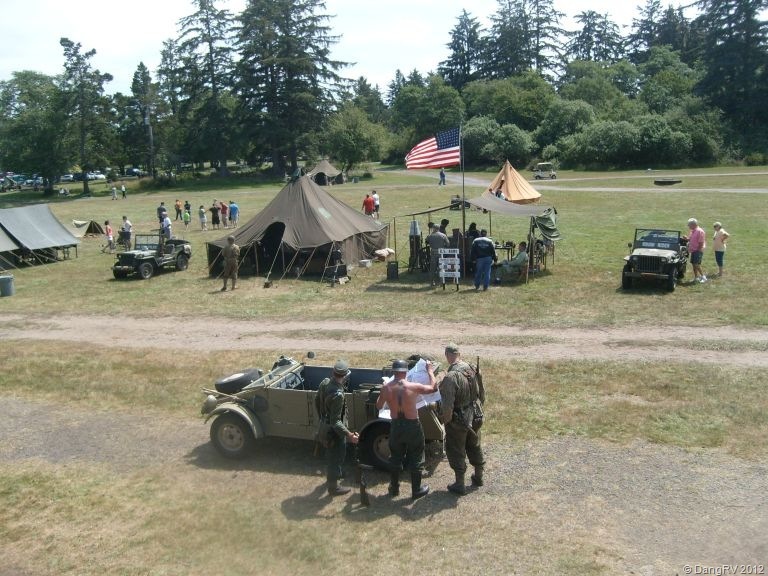 They had lots of tents and vehicles set up with displays. 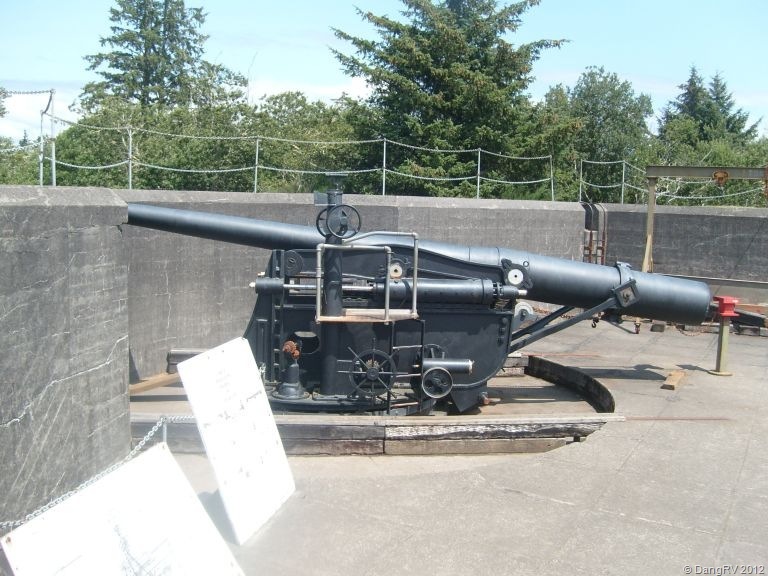 For $1, you could buy a chance to fire off a howitzer every hour. They had a small rifle range setup to shoot different military weapons. I crawled all over the concrete bunkers with everyone else and took the tour of the underground one where the really big guns used to be. Their guns hide behind the walls then popup to fire and hide again so the enemy can’t find them. Fascinating. 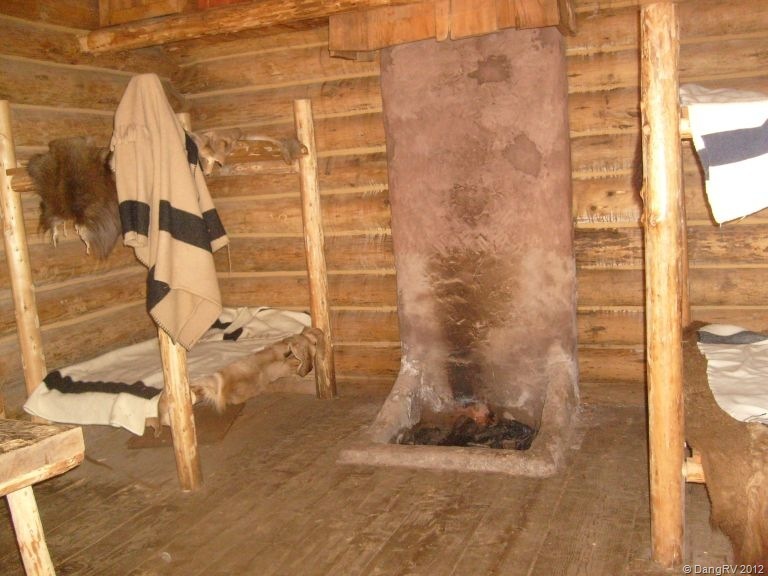 It’s hard to imagine it was really very nicely paneled, dry, and comfortable back when the fort was active. This is the only place on the US mainland that has been shelled by the enemy since 1812. A Japanese submarine fired on them one night during WWII but unfortunately, their commander would not allow them to fire back. What a bummer after all that training! 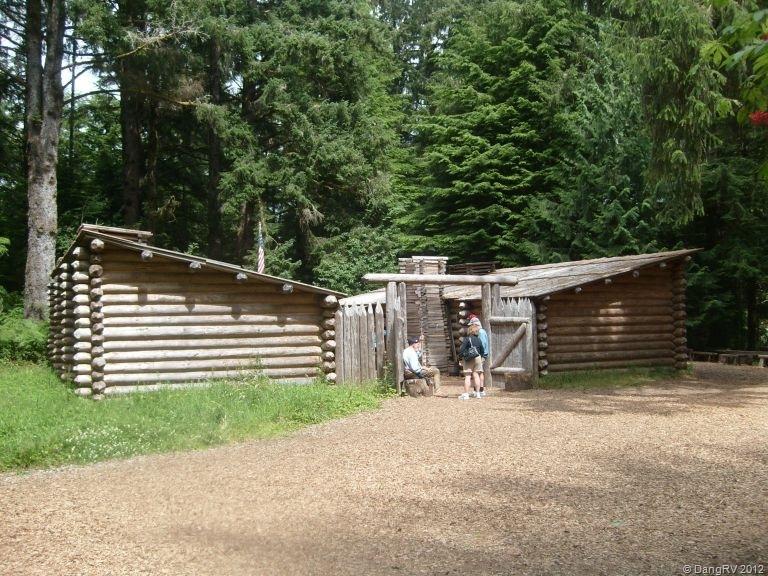 Another day I went to see Fort Clatsop where Lewis and Clark spent a miserable winter on the coast. I had seen the replica of it before but it had been awhile and the one I saw burned down and has been replaced. It’s worthwhile seeing if you are in the area. I learned a few things I didn’t know and was shocked to learn that when the Indians would not sell them a canoe, they sneaked back and stole one! Way to keep up relations, guys. Someone also demonstrated starting a fire with a concave glass. The sun came out from behind the clouds for only a few moments but he managed to start the fire in less than 30 seconds. Wow! 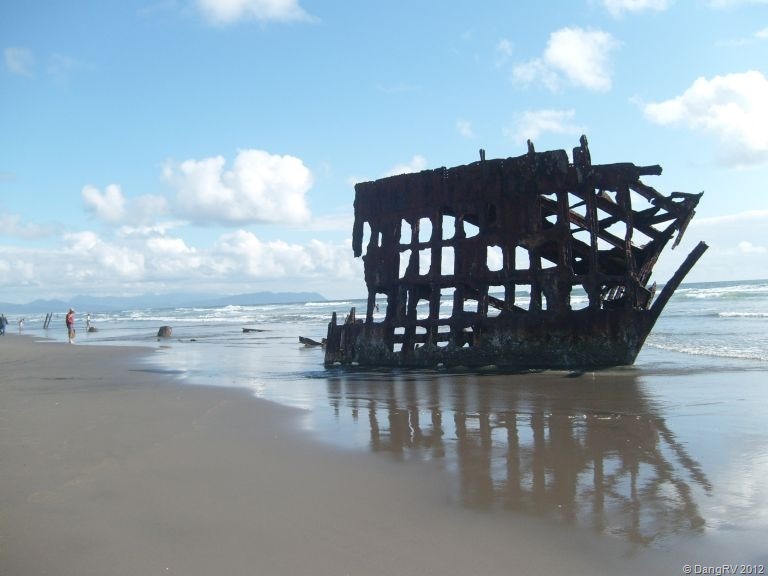 Later I went back over to Fort Stevens nearby to see the shipwreck of the Peter Iredale on the beach. Not much left anymore compared to when I first saw it. Then back in Seaside I checked out the Lewis and Clark Salt Works where they boiled sea water down for 2 months to extract the salt for curing meat and flavoring on the way home.